The model knows Curry's record-setting performance in Game 1 deservedly fetched the majority of the headlines. The boisterous crowd erupted with each made three-pointer and the degree of difficulty seemed to increase with each shot. Curry's final trey set the NBA mark for postseason three-pointers (386), a mark previously held by Ray Allen. Curry also had a well-rounded game, finishing with a postseason-best 15 rebounds and seven assists. Who wins Clippers vs. Warriors? And which side of the spread can you bank on in over 60 percent of simulations? 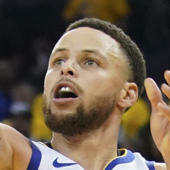 Visit SportsLine now to find out which side of the Clippers vs. Warriors spread you should be all over Monday, all from the model that's up more than $4,000 on top-rated NBA picks this season.